Why should I buy a real diamond and not an artificial diamond? A – The reason is very simple. Artificial diamonds can be replicated within a laboratory and their value does not increase over time when compared with natural diamonds. A print of a masterpiece by a famous artist isn’t as valuable as the original. Why should I buy a real diamond over investing in a diamond mining company? A – Great care is needed here because of the 170 listed diamond mining companies; only 20 to 25 are actually producing diamonds. Also these companies are linked to market sentiment and so can be volatile as seen with recent disasters such as the Gulf of Mexico oil spill and the Chilean and New Zealand mining disasters; share prices can diminish while the commodity price either increases or remains stable. How do I know my diamonds from IBX are not from a conflict region? A – All stones we handle have been through the Kimberley process, and as such they have been certificated by GIA (Gemological Institute of America), a non-profit organization and the most respected name in diamond grading. IBX only sells GIA certified and hermetically sealed Investment Grade Diamonds (“IGDs”). Can I use my IBX diamonds as jewelry? A – Of course you can, it’s your diamond and you take full ownership/control of it. However, once you break the seal your IGD would have to be sent back to GIA for fresh grading if you wanted to sell it back to IBX. Why should I use IBX and not my local jeweler? 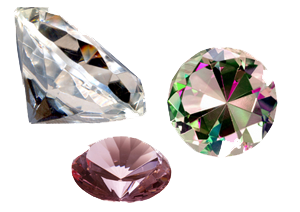 A –The difference between us and a jeweler is that we only deal with the top 1-2% of the diamond market, stones you will not find at your local mall – true IGDs that are GIA graded, hermetically sealed, laser inscribed, with an individual serial number that is visible at 10X magnification and can be verified for authenticity at the GIA site. Even though an IBX, certified Investment Grade Diamond can be used for a jewelry purpose (and they would be gorgeous), they are predominantly for investment use. What is the largest diamond ever found? A – The largest gem-quality diamond ever found is the Cullinan diamond at 3,106 carats. It was found in 1905, near Pretoria, South Africa.